Excuria Salon and Spa in Williamsville plans to expand by buying the building just up Main Street that is home to Milos restaurant, which will close once the sale is final. Excuria's owners say they will double their current space in the building at 5877 Main St., a quarter-mile from their existing salon, and have far more parking for customers and employees. The purchase is expected to close within the next two months and the expanded salon could open this time next year. "We've outgrown our current location, without a doubt," said Paul Grenauer, co-owner of the salon with his wife, Peggy. Milos opened in 2011 in the space that previously housed Marinaccio's Steak & Seafood and, before that, the Little White House. Owner Raymond Kollidas, whose brothers operate the Family Tree Restaurant in Eggertsville and Swiston's Beef & Keg in the City of Tonawanda, said he is getting out of the restaurant industry to concentrate on his digital marketing business. "It was a very difficult decision," Kollidas said. Excuria opened 28 years ago in a plaza at Main and Harlem in Snyder. Five years later, the business moved to its current site at 5725 Main St., at South Ellicott Street. Excuria offers an extensive list of services from haircuts to massages, waxing to facials and sugar body polishes to herbal steam showers. The business last expanded in 2003, when it completed a two-story addition that made it the largest day spa in the area at the time. The full building has about 6,500 square feet, Paul Grenauer said, but has grown too cramped for its hairstylists, nail technicians and other employees and the services they offer. Parking for workers and their clients is a challenge. Excuria employs 78, although not all of them are working at once. Grenauer said he and his wife, who is the driving force behind Excuria, looked at various expansion possibilities that included acquiring neighboring buildings. But he said moving into 5877 Main made the most sense. The restaurant building has about 13,000 square feet. It also has a porte-cochère, to protect drop-off and pick-up passengers from the elements, and a much larger parking lot. 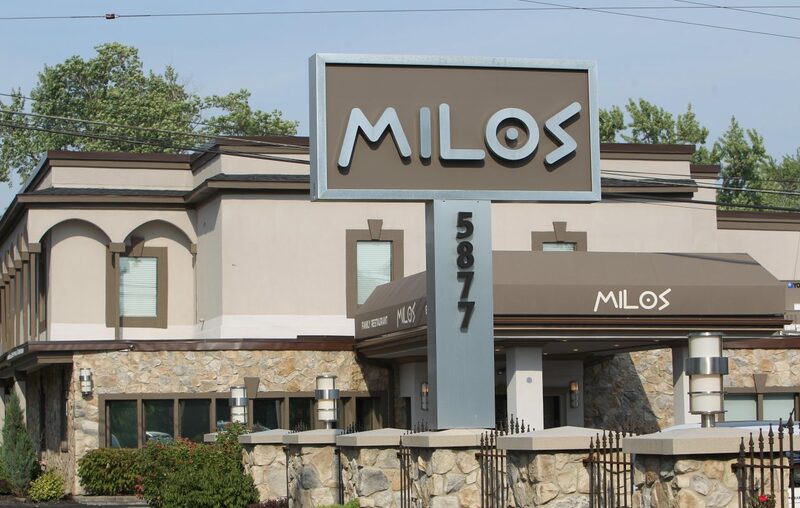 Milos is at least the third restaurant located at the 5877 Main St. site, which once hosted a racetrack for thoroughbreds called the Williamsville Driving Park. Milos has an extensive breakfast, lunch and dinner menu with an emphasis on Greek-American fare. Its name, after all, is Greek for "windmill." At the time it opened eight years ago, it featured a full bar and a 200-person banquet room upstairs, in addition to restaurant seating for 260 on the main floor. Kollidas had partnered with his brothers on some of their restaurant ventures but in recent years focused on Milos. Kollidas said the offer from Excuria was an opportunity he couldn't pass up. He said he plans to honor events booked at least through the end of May and perhaps longer. Kollidas said he doesn't plan to reopen Milos, or launch another restaurant, at this time. He said closing was a difficult decision and many customers have reacted with dismay since Buffalo Business First initially reported the news of Excuria's planned expansion. "It's like a funeral procession," Kollidas said. Excuria owns its current location and could sell the property or lease it to another business, Grenauer said. Work on the new salon and spa is still in the early planning stages. Assuming the sale closes as expected by May, construction could finish by spring 2020, he said.